German Bundesliga side Borussia Dortmund have targeted FC Basel's Nigerian winger Noah Okafor as a like-for-like replacement for Christian Pulisic, according to Eurosport Germany making reference to Blick. With FIFA banning Chelsea from signing new players for the next two transfer windows, Pulisic's transfer to Stamford Bridge can still go through as it was completed in the January transfer window before the American was immediately loaned to Borussia Dortmund. Top clubs, including Dortmund and Manchester City, have scouted Okafor and it is only a matter of time before an official bid is tabled for his services. The 18-year-old has not hidden the fact he wants to take the next step in his career as he wants to win the UEFA Champions League though he is focused on Basel ahead of a potential departure. 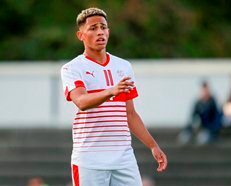 In March 2019, Okafor, who is a Switzerland U19 international, extended his contract with Basel until the summer of 2023 without a release clause inserted into the deal. This season, he has played 19 games across all competitions for Basel's first-team, scoring three goals and providing two more.